This article contains information related to ONTRAPORT customers who have 4.0 accounts that want to learn about migrating a system build from 4.0 to ONTRAPORT 5. Campaigns allows you to see all of your processes including what communications, rules, and the performance of each element in ONE place. You no longer need to have global rules, form setting rules and sequence rule steps. You won't need to call support to ask if you insert a step here in this sequence at this time and date, what will happen because everything is clearly on the Campaign map! The added benefit of using campaigns is that you can see your performance metrics from this map as well. Note: Campaign stats are not retroactive. They will display metrics as Contacts are added to the Campaign map once it is published. Campaign builder is logical and user friendly once you start playing with it. If you're familiar with ONTRAPORT, you're already familiar with the concepts! Form fillouts, landing page visits, email opens/clicks, product purchases and other items you want to track performance on become Triggers and Goals in your Campaign. Steps in your Sequences become Campaign action elements (send an email, send an sms, send a postcard, assign a task and send to fulfillment). Time in between Sequence steps become Waits. Wait filter elements in between each of your action elements to drip out content over time for both step and date sequences. Step sequences will use some time passes (e.g., 1 day) and the day of the week is (e.g., Monday) wait settings. Date sequences will use a specific date arrives (e.g., June 6) and a date relative to a Contact's date field arrives wait settings (e.g., 10 days before a Contact's birthday). 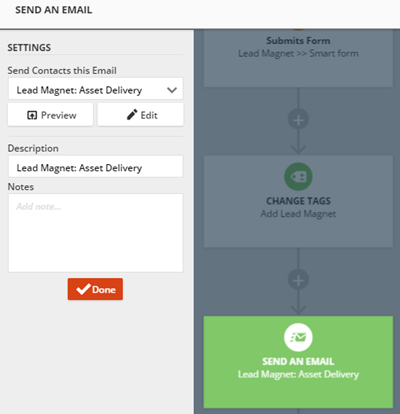 Steps to Rebuild a Process in Campaign Builder We recommend rebuilding Campaigns by collecting new leads via Campaigns, allowing existing contacts who are already on your sequences run through. Once the contacts have completed the Sequence you can delete or pause them for archiving purposes. Create a new Campaign or edit an existing one. Determine what the Triggers and Goals are of the build you're re-creating. • Triggers are how Contacts will get onto your Campaign. Common Triggers include page visits and form fillouts. • Goals are the items you want to track the effectiveness on. Common Goals include product purchases, page visits, filling out a form, clicking a particular link in an email, logging into a membership website and completing a Task with a certain outcome. Ask yourself is what is the Goal of this Campaign map and what do I want to track the effectiveness of? b. Ensure there are no red dots on any Campaign elements. This indicates that element isn't completely set. c. Confirm the settings on Triggers and Goals. d. Confirm all action elements are set. Press the preview button on action elements such as emails to ensure the email is selected and not in a draft format. Note: If the add to Campaign element is used, ensure that all nested Campaigns are also complete and published. Remove Sequences and Tags from your form settings. Contacts who are already on the Sequences will continue to run through them until they're complete. New contacts will run through the Campaign once you've published it. a. Save and Publish your Campaign. b. Fill out your smart form and test it to ensure you are added to the Campaign and that all communication fires as desired. The image below shows the build between 4.0 on the left and ONTRAPORT 5 on the right. The Smart Form adds a Tag and a Sequence. 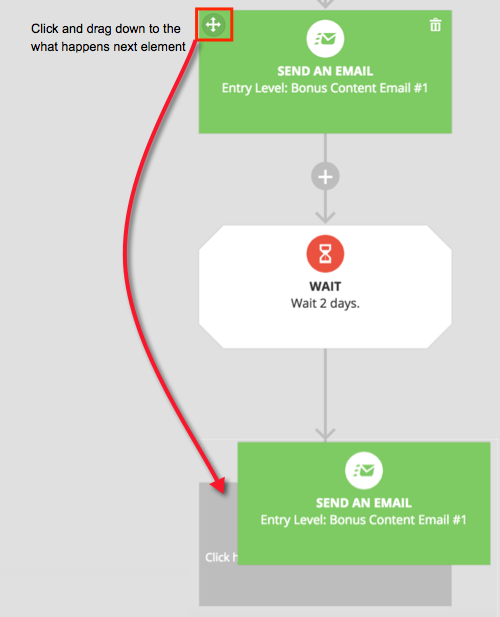 The Sequence contains two email steps. The first fires immediately and the second fires one day later. Add a Trigger to your Campaign map. Click the + Add New Trigger button and select Contact submits form. Select your form. This is how contacts who will out the form will enter the Campaign. a. Who can activate this trigger? If this is a lead generation form, the most common setting is any contact in account. b. If Contact is already on map, then... Assuming this is a lead generation form, the most common setting is add here again when triggered. Review the smart form settings. If there are Tags being added, add a Change Tags element below your Trigger. Select Add in the settings and click the +add button. Add in multiple tags by clicking the + Add button again. Now we'll recreate the Sequence steps. If possible, open the Sequence you are recreating in a separate tab or window so you can see both the Sequence steps and the Campaign. 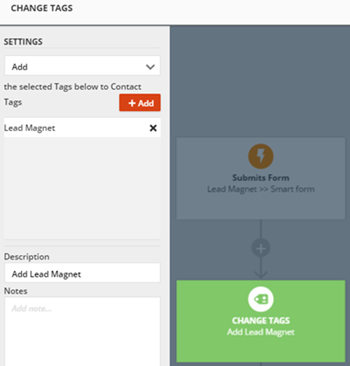 To send an email after the Smart Form is filled out, add a send an email action element below the Trigger (or below the Change Tags element if you added one in step 3). Use the pulldown in the settings area to select the email message. 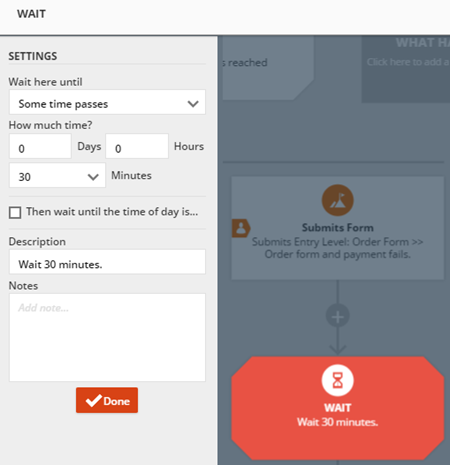 Review the next step in the Sequence and take note of the the timing in schedule step section as well as the email message selected. 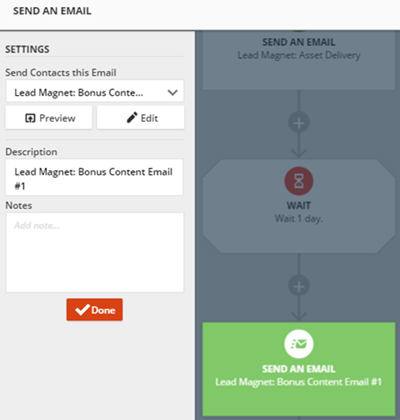 After the send an email element, add a Wait filter element to pause contacts in between campaign elements. In the example below, we've added a 1 day wait. For date sequences, you can use the wait here until pulldown to select a specific date arrives (e.g. June 6) or a data relative to a Contact's date field arrives (e.g. 5 days before a Contact's birthday). Add a send an email element below the wait. Use the pulldown in the settings area to select the email message. Continue adding any elements to mimic your Sequence. Confirm steps 1-6 are complete. If this is the end of your Campaign, add an End element. Optional: If you'd like to give your audience the ability to unsubscribe from the Campaign, click the Subscription Settings link. 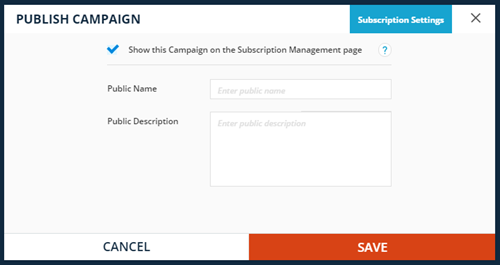 Check the box next to Show this Campaign on the Subscription Management page and enter a public name and description. The text entered in this box will show on the manage email preferences page if your audience clicks the link at the bottom of their emails to unsubscribe. Find your Smart Form > Form Settings. Remove the Tags and Sequences from the Form settings. a. Fill out your Smart Form. b. Locate your contact record. c. Find the sequences and tags section. Confirm the Campaign has been added. d. View the Campaign. Click on Performance. e. Click on any number below an element that you have received or noticed in your contact record. A group of contacts will open and your contact record should be included. 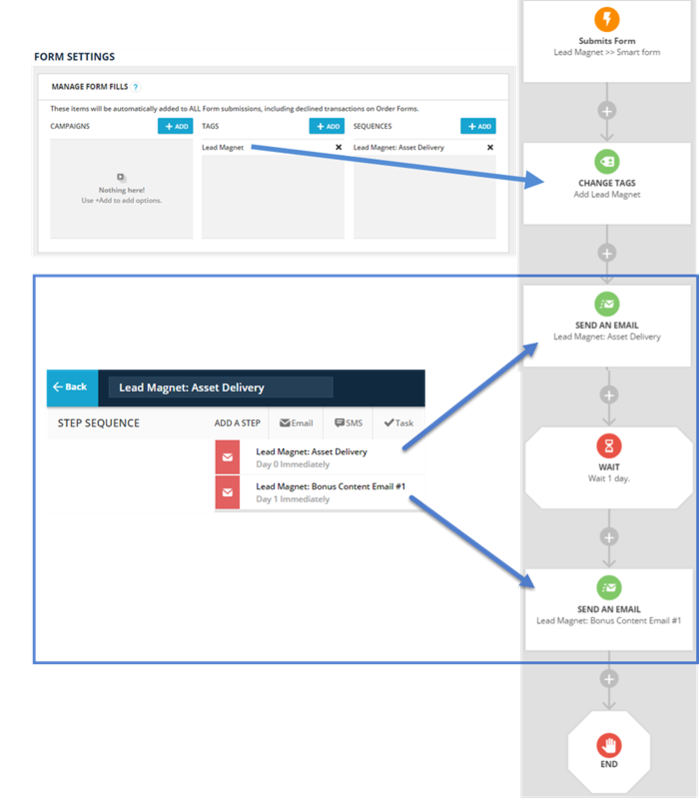 This usecase is an example that show how to build a Campaign from scratch to mimic product delivery and managing a failed transaction from an order form. 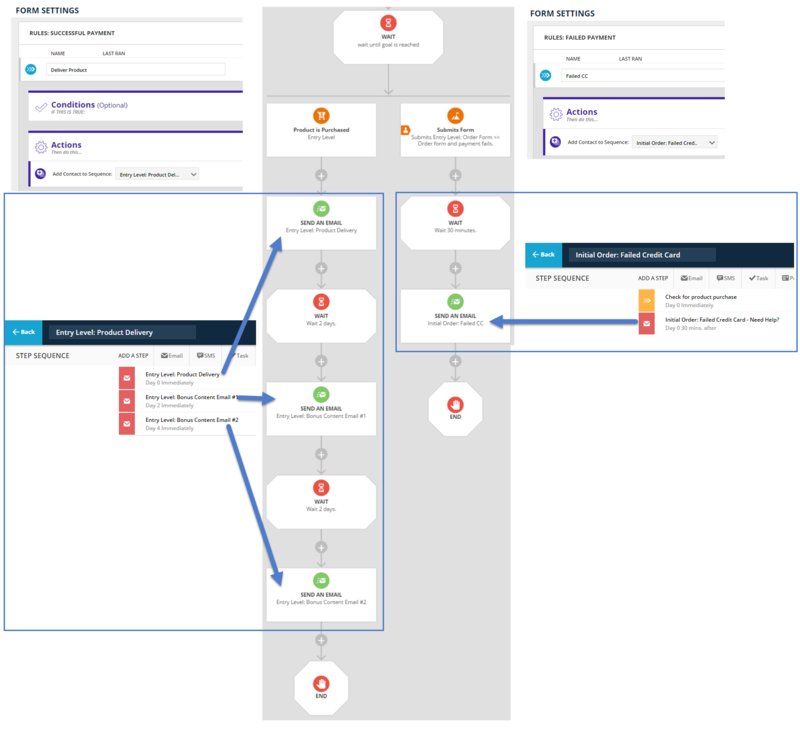 The image below shows the ONTRAPORT 4.0 successful payment rules and accompanying Sequence on the left, the ONTRAPORT 5 Campaign in the middle and the ONTRAPORT 4.0 failed payment rules on the left. This sample build has a successful payment rule that contains a product delivery email that fires immediately. Then, the new customer receives two bonus content emails that fire two days apart. If the customer's card declines on the order form fillout, this build will wait for at least 30 minutes and if the product is still not purchased, they'll receive an email offering assistance and ensuring they didn't have issues purchasing the product. We'll build the successful purchase route first. Add a Goal to your Campaign map. We recommend a Goal so you can gain better performance metrics. You can use a Trigger if necessary. Click the + Add New Goal button and select Contact purchases product. Select your product associated with your order form. a. Who can achieve this goal? The most common setting is any contact in account. b. If Contact is already on map, then... The most common setting is move here when achieved. Now we'll recreate the successful rules Sequence steps. If possible, open the Sequence you are recreating in a separate tab or window so you can see both the Sequence steps and the Campaign. 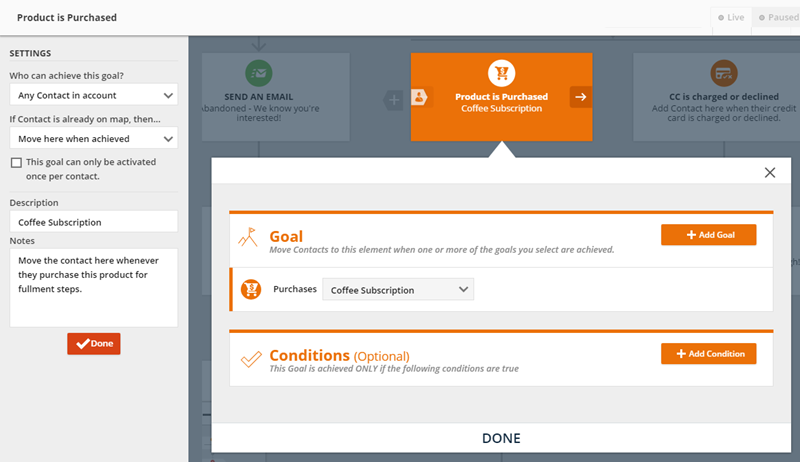 To send an email after the product is purchased, add a send an email action element below the Goal. Use the pulldown in the settings area to select the email message. Review the next step in the Sequence and take note of the scheduled step. 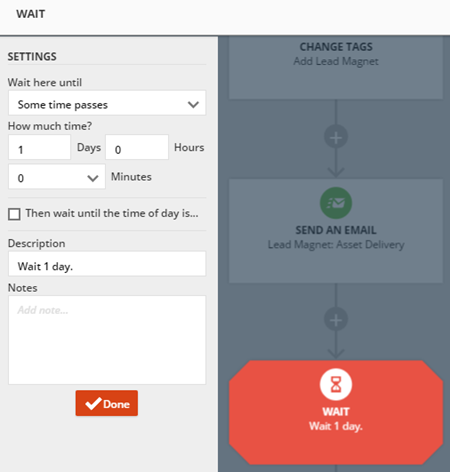 After the send an email element, add a Wait filter element to pause contacts in between campaign elements. In the example below, we've selected some time passes and a 2 day wait. The next two elements (a 2 day wait and an email) are exactly the same except for a different email message. Try this time saving tip! On the second email element (the one below the product delivery email), hover over the left corner until cross hairs appear. Click and drag the email element and release it on the what happens next element below. If that seems challenging, then follow steps 4-5 again. Then skip to step 10. A move or copy window appears. 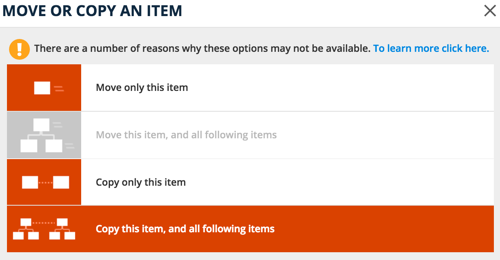 Select copy this item, and all follow items. Two new items should appear - an email and a wait for 2 days. Here is what your Campaign will look like below the initial product delivery email. Select your second email by clicking on the send an email element. Continue adding any elements to mimic your Sequence. Confirm steps 1-9 are complete. Now create the path for a failed transaction. 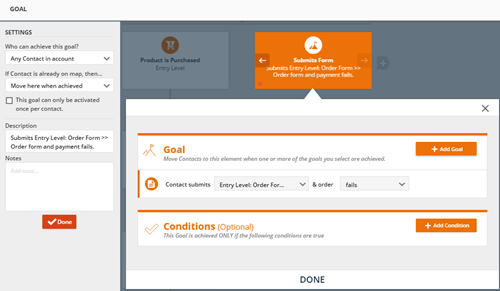 Add a Goal next to your product purchase. Click the + Add New Goal button and select Contact submits form. Select your order form. Under the & order dropdown, select fails. Add a Wait after the Goal. Select some time passes and select 30 minutes. This gives the customer time to re-enter their order because their card declined the first time. 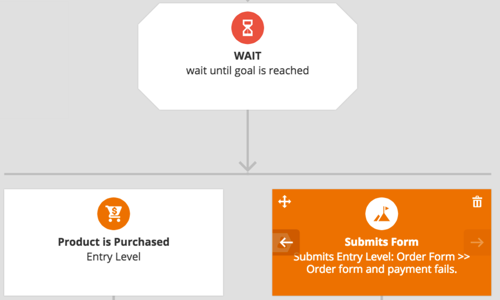 If the customer tries another card and it is successful, they will automatically move from this Wait to the Successful goal for product purchased. 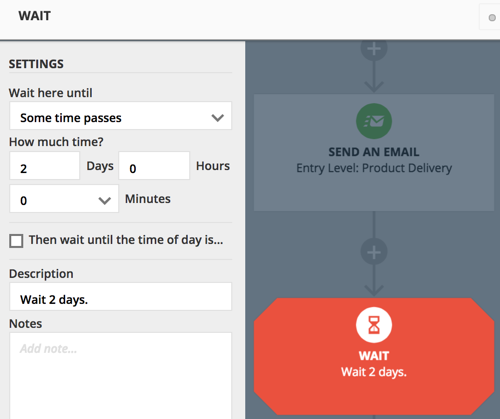 Add a send an email action element below the Wait. Use the pulldown in the settings area to select the email message that will be sent if the transaction fails. Add an End element below the email. Then click the save and publish button. Find your Order Form > Form Settings. Delete the successful and failed transaction rules. a. Fill out your Order Form. I don't know what Tags, Sequences and Rules fire when a form is filled out. How do I reverse engineer my system build? Recreate the items that fired in a Campaign map and follow the steps above for Rebuild a Process in Campaign Builder. Note: This process does not cover any items that may fire later such as Global Rules that wait to be triggered by Date, changes/updates in fields or other actions.